1. Photograph of Margaret Bourke-White. 2. MARGARET BOURKE-WHITE (1904-71): Oxford Paper, Rumford, Maine (1932). 3. BOURKE-WHITE: George Washington Bridge (1933). 4. BOURKE-WHITE: First issue of Life magazine (Nov. 23, 1936). 5. BOURKE-WHITE: The Louisville Flood (1937). Published in Life magazine. 6. BOURKE-WHITE: Maiden Lane, Georgia (1936). 7. WALKER EVANS (1903-75): Sharecropper's family, Hale County, Alabama (1936). 8. EVANS: Roadside store between Tuscaloosa and Greensboro, Alabama (1936). 9. EVANS: Billboards and Frame Houses, Atlanta, Georgia (1936). 10. 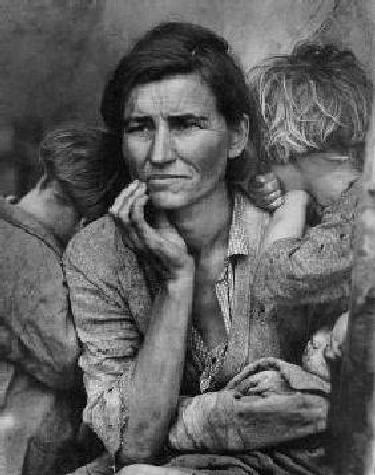 DOROTHEA LANGE (1895-1965): Migrant Mother, California (1936). 11. LANGE: A Depression Breadline (1933). 12. LANGE: Towards Los Angeles (1937). 13. LANGE: Family walking on highway, Oklahoma (1938). 14. LANGE: Migratory cotton pickers, California (1939). 15. NORMAN ROCKWELL (1874-1978): Homecoming GI (1945). 16. ROCKWELL: Two Saturday Evening Post covers. Left: Gaiety Dance Team (1937). Right: Deadline (1938). 17. DIEGO RIVERA (1886-1957): Man at the Crossroads (RCA Mural). In class, I showed the photograph taken by Lucienne Bloch just before all work was stopped in May 1933. Shown in the web link is Rivera's reproduction of the mural (1934). 18. RIVERA: detail of Man at the Crossroads (RCA Mural). Detail of nebula containing hammer-and-sickle star; Sanchez Flores viewing mural. 19. Photograph of pickets in New York City on the anniversary of the "Battle of Rockefeller Center" (1934). Photo by Lucienne Bloch. 20. RENE MAGRITTE (1898-1967): The Human Condition I (1934). 21. ROCKWELL: Triple Self-Portrait (1960). 22. MAGRITTE: The Red Model (1937). Compare with Walker Evans' photo of a pair of boots. Below: MARCEL DUCHAMP (1877-1968) and ENRICO DONATI: Window Display, Brentano's, New York City (1945). 24. MAGRITTE: The False Mirror (1928). 25. WILLIAM GOLDEN (1911-59): CBS "eye" logo (1952). 26. DR. SEUSS (THEODOR SEUSS GEISEL, 1904-1991): Flit ad campaigns (1930s).